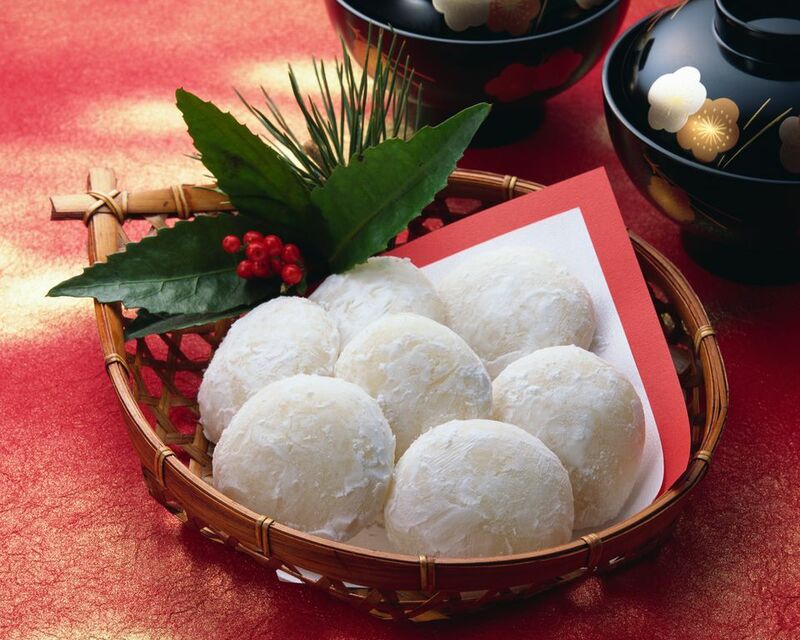 Mochi is a Japanese rice cake that is made from steamed white rice or glutinous rice. It can also be made from steamed brown rice. Alone, mochi is a staple food in Japanese cuisine, but it also acts as an important ingredient in many Japanese foods such as desserts, soups (both savory and dessert types), and hot pot dishes. It can also be grilled, baked or fried. Fresh mochi is very pliable, soft, sticky, and chewy but should be eaten on the same day it was made or the next day at the latest. It has a tendency to harden very quickly. If the mochi is left out, it becomes dry and hard and will be unenjoyable. This type of mochi is typically flat and round. Mochi is also available in shelf-stable packages, and is known as "kirimochi" or "kakimochi," but these rice cakes tend to be hard, and is best used in recipes that grill, boil, or deep fry the mochi. This type of mochi tends to be shaped in flat squares or rectangles. Mochi is made by first steaming plain rice and then pounding it into a smooth mass. Traditionally, mochi was made during a Japanese ceremony called "mochitsuki" which translates to "pounding mochi." Freshly steamed rice is placed in an oversize mortar that stands on the ground almost waist-high. The steamed rice is sprinkled with water, then pounded with a large wooden mallet until smooth. The ceremony consists of one person who pounds the mochi using the mallet, while a second person continuously turns the mochi and drizzles water on it to keep it moist and pliable. Once the mochi is pounded smooth, it is torn off into smaller pieces and shaped into round semi-flat circles. Mochi can also be made using a mochi maker kitchen appliance, available for sale at some Japanese stores or online. Fresh mochi is difficult to store because it quickly begins to mold if left at room temperature for longer than one day, or two days maximum. Fresh mochi should not be stored in the refrigerator as it will become hard and not usable. Instead, quickly store fresh mochi in the freezer. It can be cooked without first defrosting. When shopping for ready-made mochi at a Japanese or other Asian supermarkets, you'll find the basic mochi (that which is made simply from steamed rice), is often sold in flat round shapes. Mochi is also sold in squares, and in other Asian cultures, mochi is also shaped in the form of cylindrical sticks. Mochi is either sold fresh or individually cut and vacuum sealed in shelf-stable packages. Shabu-shabu - In Japanese hot pots such as shabu-shabu, mochi may also be added as an ingredient. Sukiyaki - Sukiyaki is also a Japanese hot pot style dish, and one of the ingredients may be mochi as well. Sakura Mochi - Sweet glutinous rice cake wrapped in pickled cherry blossom leaves. Traditionally enjoyed on Japanese Girls' Day. Zenzai - Sweet red bean soup with toasted mochi. Kashiwa Mochi - Rice cake filled with sweet red beans and wrapped in an oak leaf. Traditionally enjoyed on Japanese Children's Day or Boy's Day. Mochi, or rice cake, is extremely thick and chewy, so it is very important to take small bites of mochi and chew very well to avoid choking. It is a common hazard in Japan, despite the country's love of mochi.